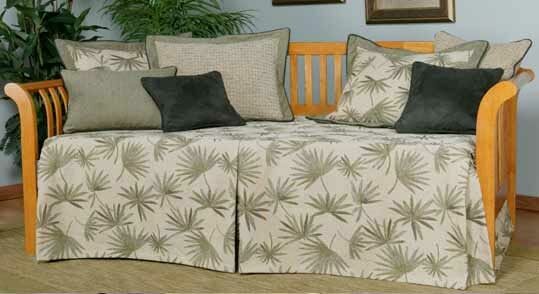 Daybed Covers come in a variety of styles and fabrics, and will fit most standard twin sized mattresses and daybeds. They can be customized, but normally have a drop of 21" from the top of a Standard 39" X 80" Mattress, covering the undercarriage of the Daybed. Don't forget to add Pillows, Window Treatments, or Accent Furniture consisting of Slip Covered Chairs, Nesting Ottomans, and Bean Bags, to complete your rooms decor.